BOUNDARY Commission completed their review of Woking on Tuesday and presented their final recommendations for the borough council’s electoral arrangements, and subject to Parliamentary approval, the new ward designations will go ahead in time for the all-out borough elections in 2016. The Independent Local Government Boundary Commission for England propose that Woking be represented by 30 councillors, six fewer than the current set-up. 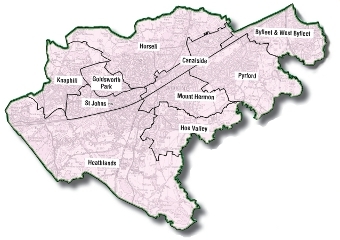 They also propose that those councillors represent 10 three-member wards. Following representation from both the council and residents, the Commission’s changes to the original draft proposals include: renaming Sheerwater ‘Canalside’ and extending the new ward west to include properties around the Morrison’s supermarket; moving Old Avenue, Hollies Avenue and Woodlands Avenue to the Byfleet & West Byfleet ward, rather than Canalside (Sheerwater) as put forward in the draft recommendations; extending the Knaphill ward to include Carthouse Lane; and incorporating Mayhurst Avenue, Crescent and Close as well as East Hill in the Pyrford ward. Leader of Woking Borough Council, John Kingsbury, said: “I would like to thank residents for making their representations to the Boundary Commission during the consultation period. “While I am aware that not everyone will be happy with the outcome of their recommendations, the Commission have at least taken into account some, although not all, views of local residents. One group of people happy with the outcome of the Commission’s review include petitioners, led by Graham Phillips, who were against being included in the new Canalside ward. He said: “We in Woodlands Avenue and Hollies Avenue in West Byfleet are delighted the Boundary Commission have recommended that our roads be within the new Byfleet & West Byfleet Ward, so reversing their previous recommendation. The new arrangements will be laid before Parliament in the coming months and will come into force in time for the all-out borough elections in 2016, when 30 councillors will be voted in, instead of the current 36. Once the wards are confirmed, the council will conduct a comprehensive review of polling stations. The publication of the arrangements follows a 12-week consultation of the draft proposals, and draws redesignated boundaries for each ward across Woking. Chairman of the Boundary Commission, Max Caller, said: “We are extremely grateful to people across Woking who took the time and effort to send us their views. “We considered every piece of evidence we received before finalising these recommendations. “Across the borough, we have sought to balance the views expressed to us by local people with the criteria we must apply when we are deciding on new electoral arrangements. In response to representations on the draft recommendations, the Commission made changes to the proposals that were originally put forward for consultation in July last year. Elsewhere in the borough, minor changes were also included. The proposed new arrangements must now be implemented by Parliament. A Draft Order – the legal document that brings into force the recommendations – will be laid in Parliament and will provide for the new electoral arrangements to come into force at the council elections in 2016. FULL details of the final recommendations are available to view on the Boundary Commission’s website at www.lgbce.org.uk.